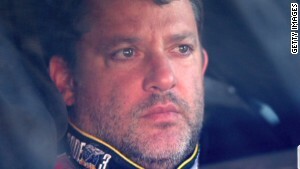 (CNN) -- Tony Stewart's profession is driving for millions of dollars a year in NASCAR races, but his hobby is racing against amateurs on dirt tracks for trophies. Stewart, 43, started in go-carts when he was just 5 in Columbus, Indiana, 50 miles south of the Indianapolis Motor Speedway. 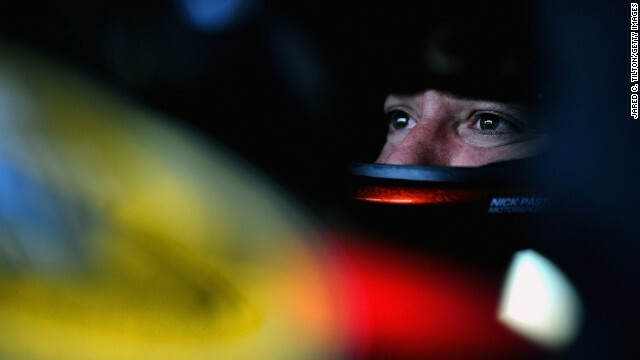 He rose through the ranks, winning the Indy Racing League championship in 1997 before moving to NASCAR two years later. Driver Tony Stewart looks on in the garage area during practice for the NASCAR Sprint Cup Series Cheez-It 355 at Watkins Glen International on Friday, August 8, in Watkins Glen, New York. Stewart is a three-time champion in NASCAR's top division and also won a sprint car championship in 1995. Stewart signs autographs for fans during a practice for the NASCAR Sprint Cup Series Camping World RV Sales 301 at New Hampshire Motor Speedway on July 11 in Loudon, New Hampshire. Stewart gets out of his car after an incident during the NASCAR Sprint Cup Series Coke Zero 400 at Daytona International Speedway on July 6 in Daytona Beach, Florida. Danica Patrick and Stewart ride down pit road before the NASCAR Sprint Cup Series Quicken Loans 400 at Michigan International Speedway on June 15 in Brooklyn, Michigan. 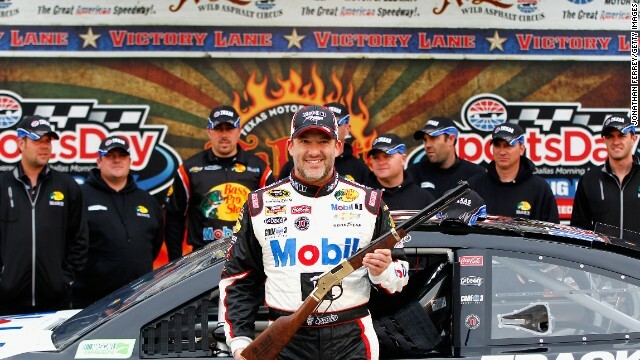 Stewart poses with a rifle given as a pole award after qualifying for pole position for the NASCAR Sprint Cup Series Duck Commander 500 at Texas Motor Speedway on April 5 in Fort Worth, Texas. 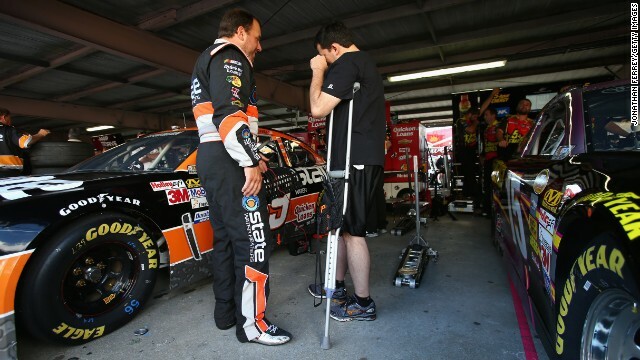 Driver Ryan Newman talks with team owner and injured driver Tony Stewart, on crutches, in the garage during practice for the NASCAR Sprint Cup Series AAA 400 at Dover International Speedway on September 28, 2013, in Dover, Delaware. Stewart broke his leg on August 5, 2013, during a race at the Southern Iowa Speedway in Oskaloosa, Iowa. Personnel prepare to load Stewart into an ambulance after he was involved in a four-car wreck at Southern Iowa Speedway in Oskaloosa, Iowa. Stewart underwent successful surgery Tuesday, August 6, 2013, to repair the broken right tibia and fibula suffered in the wreck. 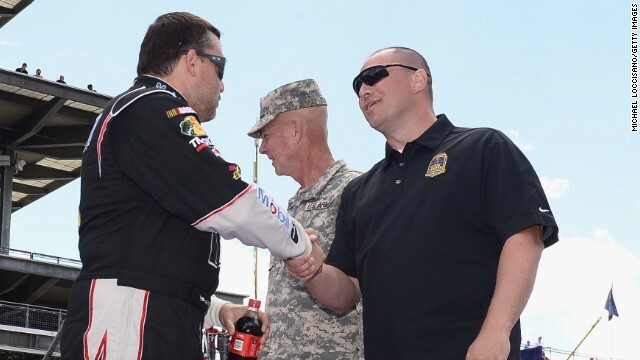 Stewart shakes hands with Gunnery Sgt. Samuel Deeds at the Indianapolis Motor Speedway on July 28. As winner of the annual Crown Royal "Your Hero's Name Here" program, Deeds received naming rights to the July 28 NASCAR Sprint Cup Series race at the Brickyard. Stewart sits in his car during practice for the NASCAR Sprint Cup Series Camping World RV Sales 301 at New Hampshire Motor Speedway on July 12, 2013, in Loudon, New Hampshire. 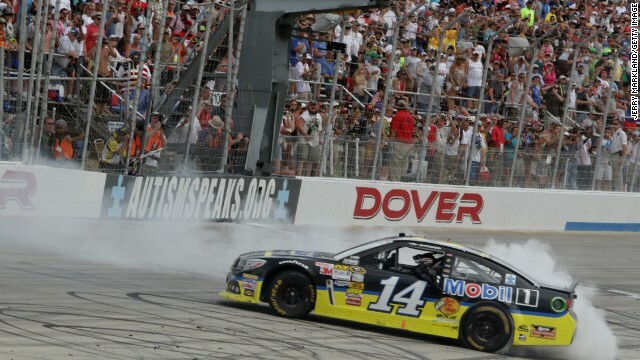 Stewart celebrates with a burnout after winning the NASCAR Sprint Cup Series FedEx 400 at Dover International Speedway on June 2, 2013, in Dover, Delaware. 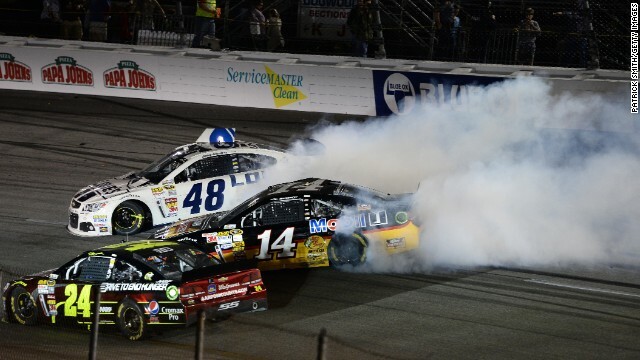 Stewart, in car 14, spins out along with Jimmie Johnson, in car 48, after an on-track incident during the NASCAR Sprint Cup Series Toyota Owners 400 at Richmond International Raceway on April 27, 2013, in Richmond, Virginia. 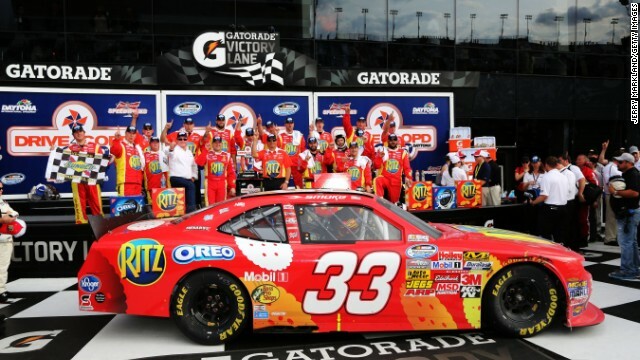 Stewart poses in the victory lane after winning the NASCAR Nationwide Series DRIVE4COPD 300 at Daytona International Speedway on February 23, 2013, in Daytona Beach, Florida. He's won three championships in NASCAR's top series -- the Sprint Cup -- and he's a co-owner of his racing team. Tony Stewart known as a 'hot head'? Other drivers started calling him "Smoke" because that's what they saw coming from his tires as he steered aggressively through turns on asphalt tracks. While burning rubber wore down tire tread needed late in a race, it added to his reputation as one of the most competitive drivers, both behind the wheel and off the track. Sponsors pay big bucks to display their logos on Stewart's No. 14 car because they know millions will watch it speed around the big track hundreds of times in a single event, as many as three dozen weekends a year. His bad-boy antics, the fights and the words, make him stand out among dozens of other personalities in the sport. Even the fans who boo him are watching. He shows up unshaven on race days in contrast to more polished drivers who are more careful with words and actions to avoid alienating sponsors and fans. Winning, either on NASCAR's asphalt or unsanctioned dirt, is Stewart's goal. As he sacrifices valuable tire tread for track cred, he also puts great passion into his non-paying hobby, carried out at the risk of his big-money professional driving. "Being on a dirt track a lot of times is like being on a gravel road," Stewart said in a 2006 interview. "If you go just a little bit too fast the car's going to slide. If you hit the gas too hard, it spins the tires or kicks the rocks up. If you try to stop too fast, you skid, you lock up the brakes. That's what makes driving on dirt more technical." When he won a dirt track race in Michigan last month, he tweeted to fans as if he'd won the Daytona 500: "If you haven't heard already, I ran my sprint car tonight and won! Felt great to run it again. Was a 2nd place car but had a little luck :)" That "little luck" was the driver of the lead car crashing. 1yr ago today my life changed. Thank you to everyone that worked so hard to get me back to where I'm at today. It's your life, live it! Stewart was leading a 30-lap dirt track race at Southern Iowa Speedway a year ago when his car flipped, breaking two bones in his right leg. It ended his NASCAR Sprint Cup 2013 season 15 races early, costing him and his sponsors a lot of money. The August 11, 2013, race at Watkins Glen, New York, was the first start Stewart missed in 521 NASCAR races since his 1999 debut at the Daytona 500. Ironically, he missed Watkins Glen again this year because of a dirt track tragedy on Saturday. Stewart hit and killed another driver, Kevin Ward Jr., during a sprint car race at Canandaigua Motorsports Park in Ontario County, New York. Video shows that Ward and Stewart appeared to make contact coming out of a turn and Ward hit the wall and was knocked out of the race. Ward, 20, then got out of his car and walked down the track toward the other racers, who had slowed for a yellow flag. Ward pointed a finger and appeared to be yelling. One car swerved to avoid him, but Stewart's right-rear tire appears to hit him as he passes. "There aren't words to describe the sadness I feel about the accident that took the life of Kevin Ward Jr.," Stewart said in a written statement. Veteran race fans remember a rookie driver who jumped out of his car during a NASCAR race in 1999 after another driver spun his car into him in Martinsville, Virginia. That driver was Tony Stewart. Stewart had traded bumps throughout the race with Kenny Irwin, who had been his dirt-track rival before they both moved up to NASCAR. But the last crash against the wall disabled Stewart's car. Stewart waited on the track for Irwin to circle around under a caution flag. Stewart threw his gloves at Irwin's car, and jumped onto its right side while the car was still moving. 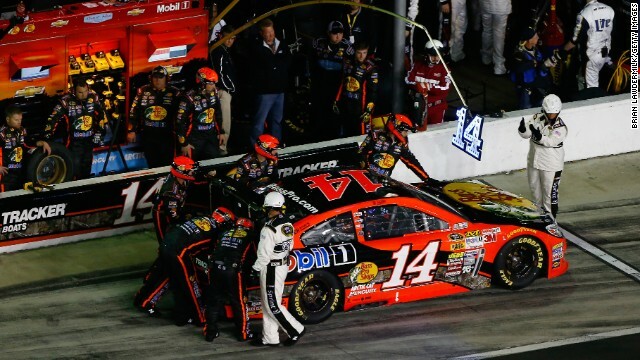 Stewart's run-ins with other drivers are legend, including after his car crashed with Matt Kenseth at Tennessee's Bristol Motor Speedway in 2012. Stewart waited in a driving lane on pit road for Kenseth's car to return to the track. Stewart threw his helmet at Kenseth as the car sped by. He told reporters later that he doesn't "enjoy getting mad like that." 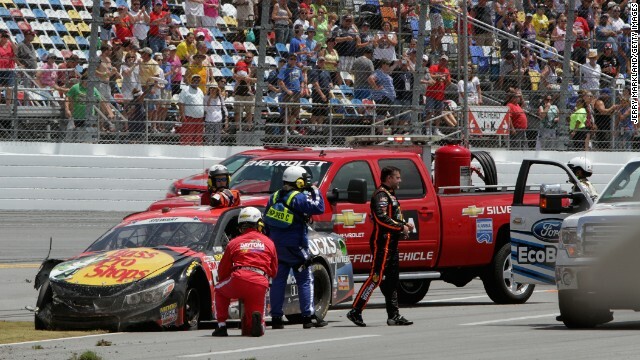 Stewart rushed after driver Joey Logano on pit row after a Fontana, California, race last year. He was angry that the younger Logano had blocked him from passing during a restart. Logano said he was just "racing hard" because he thought he could win. Stewart has also had his angry moments with fans and the media. He was investigated, though never prosecuted, for an alleged assault against a female fan at Bristol Motor Speedway in 2002, the year he won his first of three NASCAR championships. NASCAR officials fined Stewart $10,000 and ordered him to get anger management counseling for hitting a photographer after a bad race at the Indianapolis Motor Speedway in 2002. Stewart has removed himself from racing for the present in the aftermath of Ward's death. He will not compete in a dirt track race in Plymouth, Indiana, next Saturday as he had planned, the track announced Monday. He has not yet decided if he will race in the next NASCAR Sprint Cup event at Michigan International Speedway next Sunday, his spokesman, Mike Arning said Monday. "He is grieving, and grief doesn't have a timetable." August was to have been a celebration for Stewart, the first anniversary of the dirt track wreck that changed his life. He tweeted this message to fans a week ago: "1yr ago today my life changed. Thank you to everyone that worked so hard to get me back to where I'm at today. It's your life, live it!" Although NASCAR driver Tony Stewart is not currently facing criminal charges in the death of another driver, he is not officially in the clear. 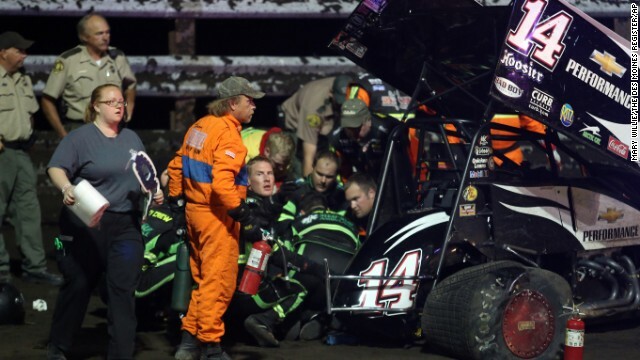 Kevin Ward Jr. died of "massive blunt trauma" when Tony Stewart hit him with his sprint car. As soon as he could, Kevin Ward Jr. got in a race car. As soon as he could, Kevin Ward Jr. started winning races. After the death of Kevin Ward Jr., NASCAR has made a new rule against drivers exiting vehicles. Alexandra Field reports. Tony Stewart's profession is driving for millions of dollars a year in NASCAR races, but his hobby is racing against amateurs on dirt tracks for trophies. Emotions play a big part in racing. The fans expect it. They want that emotion-fueled, adrenaline pumping, heart-stopping, side-by-side action. Two dirt-track racers explain the appeal of the sport and give their opinions on the fatal wreck involving Tony Stewart. Even hardened race fans, accustomed to witnessing spectacular crashes, were stunned to see the shattered body of 20-year-old race car driver Kevin Ward Jr. sprawled on a New York dirt track. 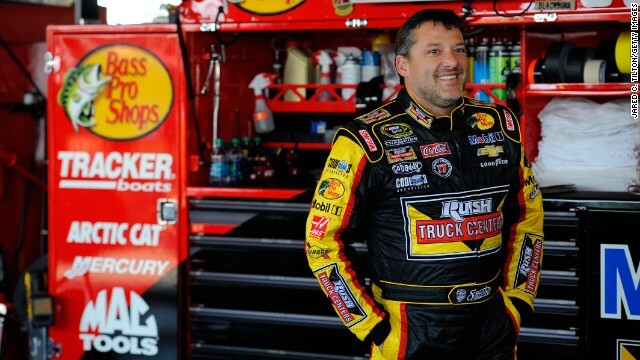 A look at recent highlights from racer Tony Stewart's career. Andy Scholes speaks with 25-year dirt track racing veteran, Danny Smith, to learn more about the popular sport. Why was Tony Stewart allowed to race? 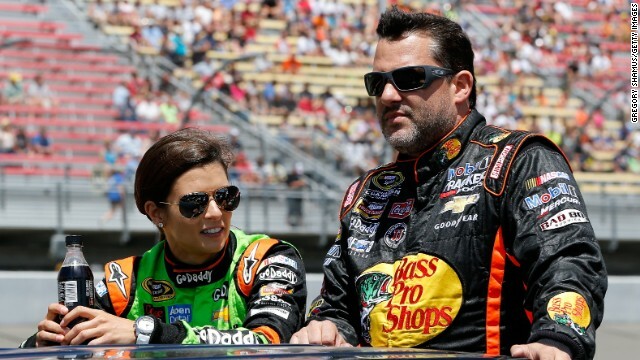 With his history of violent incidents, why was NASCAR's Tony Stewart even allowed to race? CNN's Rachel Nichols reports.